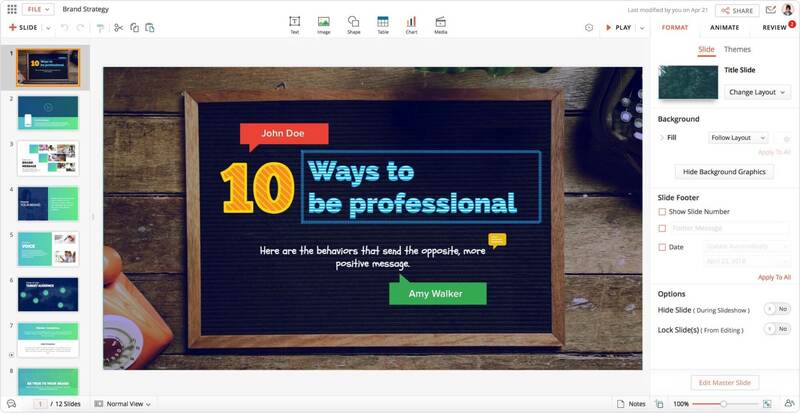 Get your team on board and collaborate on presentations in real time. Share ideas and encourage discussions around slides to deliver better results. Share presentations internally with your team, or externally with business associates, to aid in decision-making. 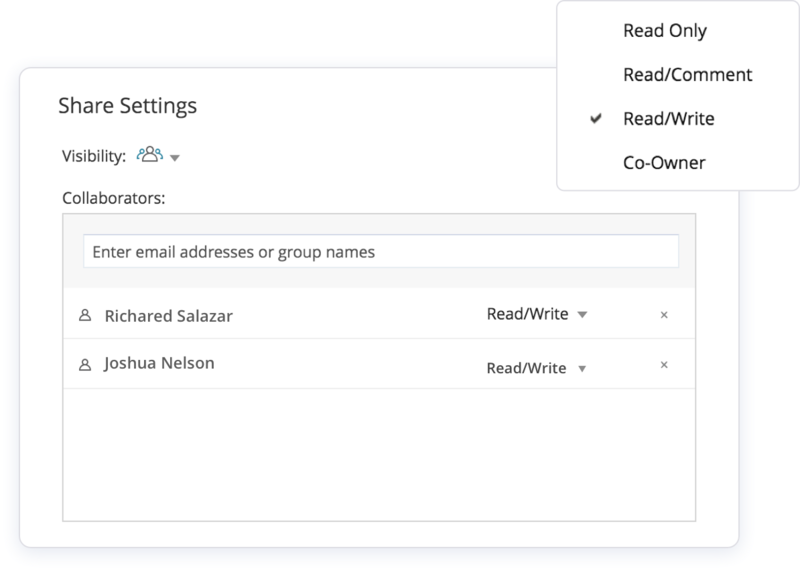 Use role-based access to give each collaborator the privileges they need. 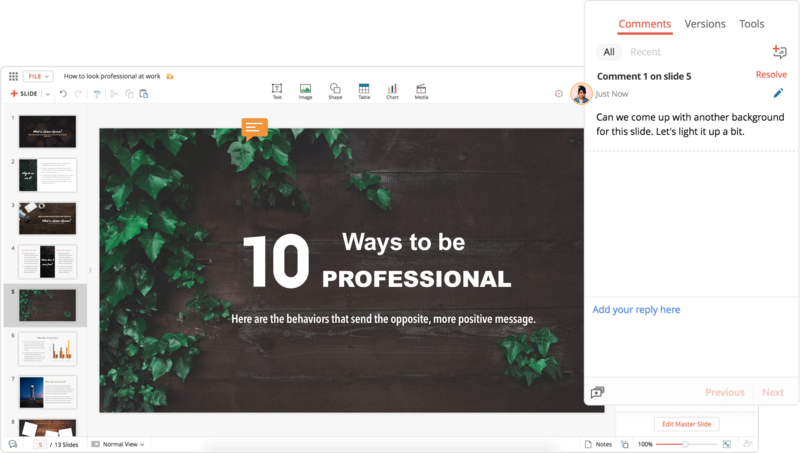 Instead of attaching large presentation files to emails, simply add them as a link. 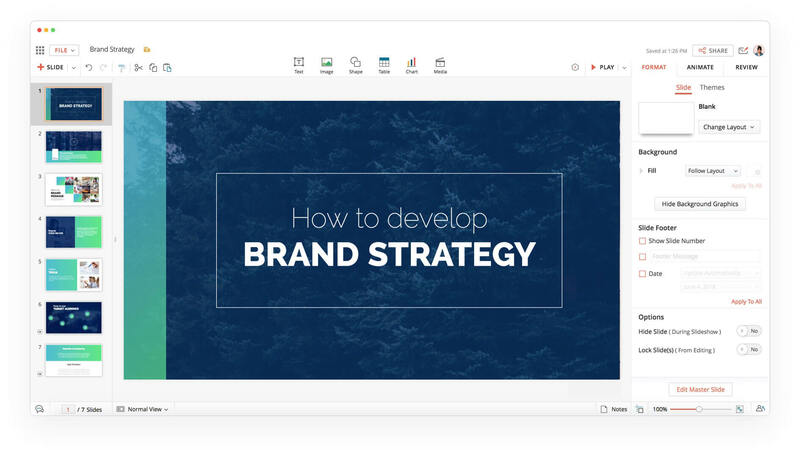 You can share your presentation with individuals, a team, or your entire organization in a single click. Assign roles to your collaborators and control who can view, comment and make changes to the presentation. 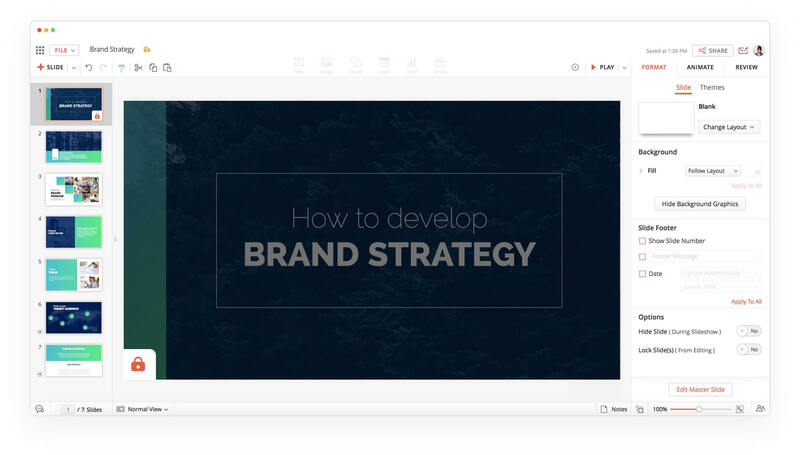 Create, edit, and design slides together with your team, irrespective of your physical location. Changes made by collaborators reflect in the shared presentation instantly. No need for multiple files of the same document. With Zoho Show, you can build a single presentation from multiple collaborators' contributions with no time-consuming merges. Invite your colleagues to brainstorm and provide feedback on your slides. 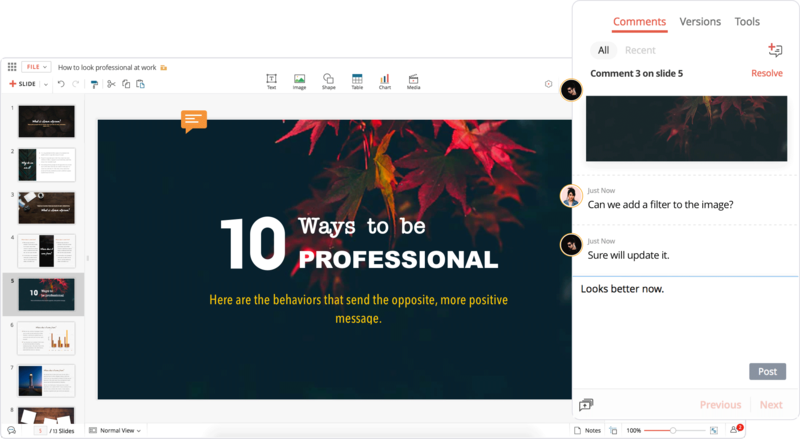 Zoho Show's robust commenting system lets you share ideas, discuss with your team and resolve questions without a hitch. 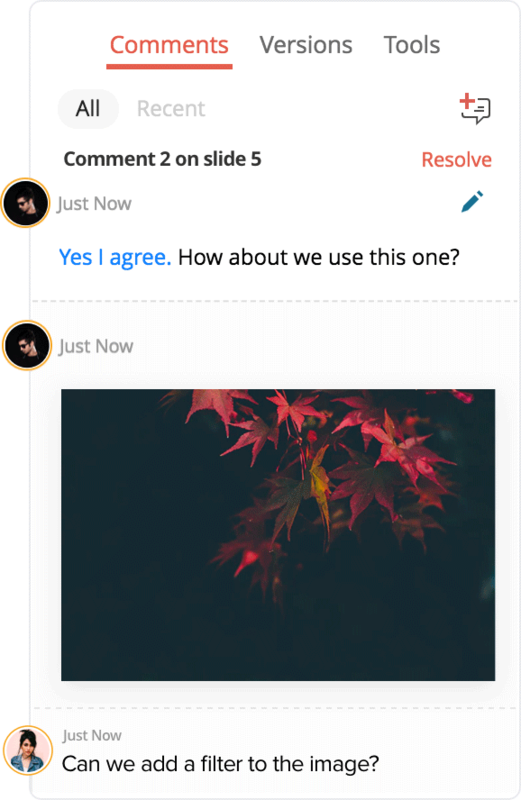 Add comments to any element within a slide, reply to existing comments, and resolve open comments at the end of a discussion. 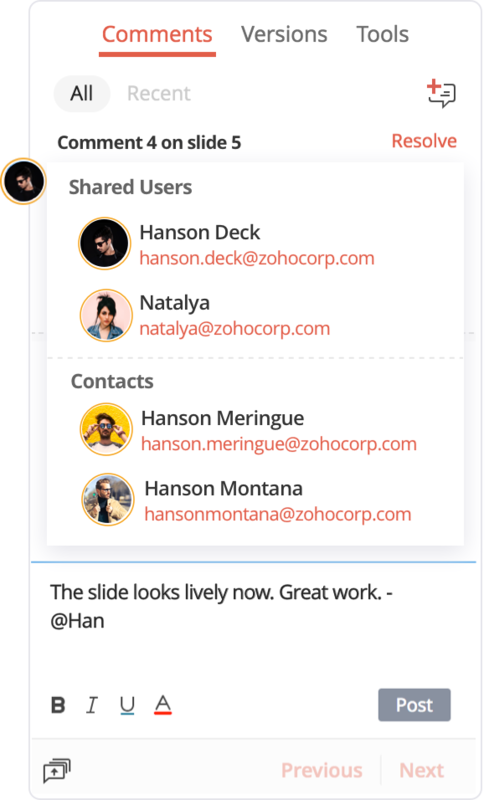 Zoho Show also offers a separate comment view so you can navigate between threads with ease. Highlight key points within your comments or replace long explanations with a simple image. Add hyperlinks to include online references. Your comments never get lost, even when you close the application. Show saves your unfinished comments as drafts for you to post later. Use " @ " followed by a user's email address to direct a comment to a particular individual. That way the recipients don't miss out on comments that need their attention. Lock a completed slide, or any section within a slide, to restrict collaborators from making further changes. 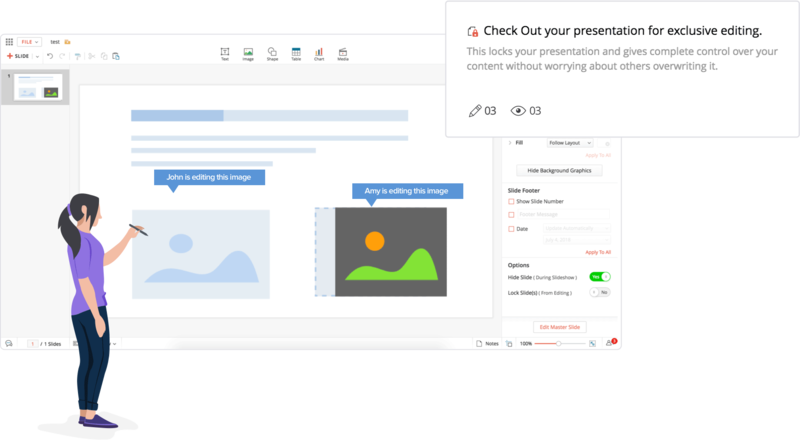 This helps you share a presentation without losing the numbers, graphs, and grouped objects you've been working on. You might want your collaborators to view a document, but not see the changes you're still making in real time. Click Check Out when you wish to edit, and Check In when you want your edits to be made available to your collaborators.